NOVEMBER 2, 2015 - PENSACOLA, FLA - Black pants matched up with navy blue shoes are a fashion no-no. So are dark brown suits with a maroon shirt. However, those mistakes are bound to happen when homeowners rummage through dark closets to select their outfits. 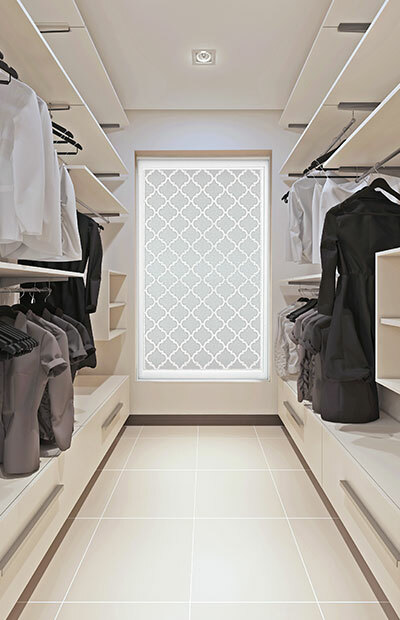 "Adding natural light to closets is definitely a trend on the upswing," says Roger Murphy, president of Hy-Lite, a U.S. Block Windows Company. "We're talking to more and more builders who relate that their customers are specifically asking not just for more space in their closets, but for more natural light." While overhead lights can help illuminate a closet, they have a tendency to "mislead" colors, making it commonplace for people to leave in the morning wearing a head-shaking clothing combination. Having natural light come into the closet is the ideal solution. However, many homeowners feel like they have to cover up their clear glass windows with shades, blinds or curtains to protect their privacy. This defeats their attempts at gaining natural light. "The solution, quite simply, is to add a privacy window to a closet," says Murphy. "Both acrylic block and decorative silkscreened patterns on privacy windows keep out prying eyes while allowing natural light to enter the closet. This adds to both the functionality and overall beauty of the closet." According to Murphy, one of the company's newest windows, the Baroque style, has seen immediate popularity for use in closets. Launched in 2015, the Home Designer Collection of eclectic decorative glass windows was inspired by designers from across the country. The windows --- Metro, Mission, Prairie and Baroque --- all allow light into the home but provide privacy for occupants of the home. "Acrylic block, glass block and decorative privacy windows can be used in a multitude of areas in the home," says Murphy. "In any space where there's a desire for natural light without the hassles of shades and window treatments, that's an ideal location for a privacy window. And, in the case of a walk-in closet, a privacy window can be a real lifesaver by reducing the chance that the 'fashion police' will come knocking at your door!"